This paper presents social enterprises as a policy tool to restore public confidence in markets and institutions. There needs to be a method to narrow the knowledge gap between research and practice in regard to social impact measurement. Additionally, there needs to be further analysis of recent innovations in social impact bonds. Currently, there is a gap in communication between researchers on social enterprises and the implementation of effective practices. There is little discussion between social entrepreneurs and academics, which has resulted in academic research that is not relevant to the issues faced by social enterprises (Mason, C. 2017). And for the research that is relevant, there is no space for social entrepreneurs to engage with academics, so they can learn and implement the findings. This is particularly critical when it comes to social impact measurement. It is incredibly difficult to quantify the social impact of a program, particularly when it relies on more qualitative data (Mason, C. & Barraket, J. 2015). However, it is an unavoidable and incredibly necessary part of ensuring that policy outcomes are being obtained. Europe is at the forefront of social innovation and entrepreneurship, and there needs to be an opportunity for Australia to utilise this abundance of knowledge. Through an increased connection with the pre-established OECD network, Australia’s capacity to deliver effective impact measurement would accelerate exponentially. This network would provide a space for relevant research findings to be shared directly with the social entrepreneurs who are implementing such measures. Acquiring suitable and sustainable funding streams can be difficult for social enterprises. Although the aim for many is to eventually be self-sustaining, this can be almost impossible without the initial capital necessary to scale. Traditional revenue streams for social enterprises, particularly in the early years, struggle to have an emphasis on the results. Social impact bonds have been used in Europe for several years now (Albertson, K. & Fox, C. 2017). These function in a similar capacity to regular bonds, but they are instead driven by outcome rather than cost. Most bonds require the government to pay for both the inputs and outputs of what they are funding. However, with social impact bonds, a private investor will pay the initial cost and the government will only pay if the desired social outcome is achieved. This new financial model ensures that the government is only paying for the intended outcomes (Holt, M. & ProQuest (Firm) 2016). This should, in turn, create a greater sense of trust in our state governments because the money they are investing is only in social programs with proven results. 1. Implementation of Social Impact Bonds: Developing an initiative to encourage all Australian state governments to set up more social impact bonds to support the initiatives of social enterprises. Social impact bonds were created in the United Kingdom and have been increasingly successful (Albertson, K. & Fox, C. 2017). To date, the United Kingdom has established more than half of the social impacts bonds in the world. Social impact bonds have a strong result focus and are incredibly outcome orientated, this could, in turn, strengthen the efficiency and effectiveness of public policy on social issues. These bonds are a relatively new concept in Australia, and there has only been a handful of pilot bonds thus far, largely instigated by state governments. The first two pilot programs were instigated by the NSW government in 2013 and there are currently 8 social impact bonds in Australia, spanning across NSW, Queensland, and South Australia with an additional 2 social impact bonds in Victoria under contractual development. A unique feature of these contracts is that they have remained flexible. Few other countries do this in the same way, and already in Australia, two social impact bonds have made changes after signing their contract to adjust their payment metrics to suit their needs better. Australia has been quite successful in raising funds through private investments which is quite unusual for OECD countries (excluding the US). Both of the above examples demonstrate huge potential for social impact bonds to create sustainable change in Australia. They have given existing organisations the ability to expand their programs and reach a wider community. It is important to note that social impact bonds are not very suitable in situations where social impact is difficult to measure. Additionally, they are only administered to pre-established organisations and might not necessarily be suitable to a start-up social enterprise. However, it is evident that an increase in impact measurement strategies will in turn give greater funding opportunities for other organisations who are currently secluded from social impact bonds. There should be greater emphasis on encouraging state governments to take better initiative. This could be done through pilot programs which should be in line with evidence-based examples and knowledge gained from internationally recognised conferences such as the OECD. Other OECD nations, particularly the United Kingdom and other European countries, have a wealth of knowledge that will be invaluable in assisting the formation of these pilot programs. It is important to note that it might be that each state will have slightly different needs dependent of what social issues are most prominent. With this in mind, it is essential to tailor the social impact bonds to the conditions of each state. This high-level dialogue should be between current social entrepreneurs, university researchers and relevant government bodies (e.g. Department of Industry, Innovation and Science, Department of Jobs and Small Business) and relevant equivalents from the other OECD countries. Existing networks should be utilised, and organisations such as the Social Impact Measurement Network of Australia should be heavily involved in the conference. This should further develop a network where social enterprises can achieve sustainable growth and continuing social impact through increased collaboration. This would also bridge the gap between Social Impact measurement methods. As a part of this, there should be specific components that place emphasis on different aspects where improvement is needed. Specifically, there should be a focus on social impact measurement. Experts from countries such as the United Kingdom should be invited to discuss the functionality and feasibility of social impact bonds. Evidently a conference can only achieve so much, and it will be the responsibility of each country to implement the outputs from discussions. However, it will provide an essential starting point for further innovation in the area. It will be important to revise policies and programs after the conference to allow for any new knowledge to be implemented. There are also the complicated logistical and financial elements to hosting a conference. This would need to be heavily discussed with the OECD countries and the OECD itself as to specifically how to distribute the burden of the conference organisational logistics. There is also the question of where to host such a conference, this would also be of critical importance. Although Australia might initially seem like an obvious choice, it is important to remember that the majority of OECD countries are located in Europe. This would in turn significantly increase the cost of travel for many of the participants. With regards to financing the conference, it would need to be a collaborative effort. It is essential that the benefits of the conference are repeatedly emphasised, as it is safe to assume that cost will be a large barrier. A key element to the conference is engaging with untapped knowledge within universities. Universities are renowned for being at the forefront of such discussions and are incredibly invested in creating spaces for these important dialogues. Australian Universities in particular do frequently fund similar conferences and no doubt would be interested in this one. Governments of participating OECD countries should also be approached for funding; however, this would increase the time needed to prepare the conference as the process is generally much slower that at a university level. There is the concern that social impact bonds might be used as a replacement for other existing government financial support programs and grants for social enterprises and non-profits. However, it should be explicitly stated that this should not be the case. Social impact bonds will not be suitable for every social enterprise, nor should they act as a substitute for other valuable government funding initiatives. This distinction needs to be clearly emphasised to avoid confusion. There is also a fear that the strong focus on results within social impact bonds will change the public service ethos or lead to a narrow mechanical determinism in service delivery. So, it is important that there is a thorough analysis of the types of organisations that are given social impact bonds. There is a lot of potential for Australia to harness social enterprises as a tool to increase effective solutions to complex social issues. The above recommendations have been designed to complement each other: the conference should generate better processes for measuring social impact and suggestions for social impact bonds; and further development in Australian social impact bonds will create more content for comparison at the conference. The conference for social enterprises would create a space to connect with experts in the field and to share best practices especially with regards to social impact measurement. The conference would allow for OECD members to broaden their network and evaluate their existing methods for social impact measurement. This should foster a more robust social enterprise community in Australia, and would encourage further innovation within the space. Additionally, more social impact bonds would allow the Australian state governments to invest in programs with proven results. This would create greater trust in the government as all funding produces a concrete impact on the community. With an increase in tangible outputs, it will assist in restoring public confidence in our institutions. The success rate thus far has been incredibly promising with all the current social impact bonds are generating returns for investors. In conjunction with the high-level conference, effective methods of implementing social impact bonds in other OECD countries could also be trialled in the Australian context. Should both the above recommendations be used in tandem then it will create a better and more sustainable environment for social enterprises to flourish in Australia. Social enterprises have been shown to be an effective form of community driven social change. Community driven change is no doubt one of the most sustainable forms of development and will in turn generate a greater sense of trust in institutions. Albertson, K. & Fox, C. 2017, “Payment by results and social impact bonds: outcome-based payment systems in the UK and US”, 1st. edn, Policy Press, Bristol. Barraket, J. 2016, "The state of social enterprise in Australia", Third Sector Review, vol. 22, no. 2, pp. 71-79. Barraket, J., Douglas, H., Eversole, R., Mason, C., McNeill, J. & Morgan, B. 2017, "Classifying social enterprise models in Australia", Social Enterprise Journal, vol. 13, no. 4, pp. 345-361. Brown, R. 2013, “UK 'Social Impact Bonds' to help children at risk”, Australian Broadcasting Corporation, Sydney. Holt, M. & ProQuest (Firm) 2016, “Pay for success projects: benefits and role of social impact bonds”, Nova Publishers, New York. Mason, C. 2017, "Social enterprise in Australia: The need for a social innovation ecosystem", AQ - Australian Quarterly, vol. 88, no. 3, pp. 25-29. Mason, C. & Barraket, J. 2015, "Understanding social enterprise model development through discursive interpretations of social enterprise policymaking in Australia (2007-2013)", Social Enterprise Journal, vol. 11, no. 2, pp. 138-155. 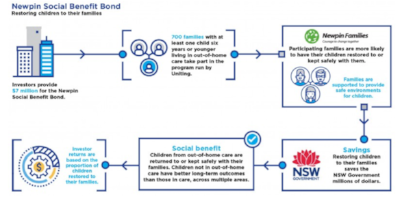 NSW State Government 2018, “Social Impact Investments”, Office of Social Impact Investment, retrieved 12/07/2018, https://www.osii.nsw.gov.au/initiatives/social-benefit-bonds/ . O'Connor, T. 2016, "What's wrong with social impact bonds? ", Kai Tiaki: Nursing New Zealand, vol. 22, no. 7, pp. 30. OECD, 2015, Social Impact Bonds: Promises and Pitfals, [online] Retrieved 03/06/2018, Available at: http://www.oecd.org/cfe/leed/SIBsExpertSeminar-SummaryReport-FINAL.pdf . Office of Social Impact Investment NSW Government, 2018, “Social impact investments”, Retrieved 03/05/2018, https://www.osii.nsw.gov.au/initiatives/social-benefit-bonds/ . Taylor, B. 2015, "Aspire Adelaide seeks to become South Australia's first social impact bond", Parity, vol. 28, no. 9, pp. 43. Tomkinson, Emma 2017, “Social impact bonds (SIBs) in Australia”, retrieved 12/07/2018, https://emmatomkinson.com/2017/07/18/aussie-sibs/ . Wong, J., Ortmann, A., Motta, A. & Zhang, L. 2016, "Understanding Social Impact Bonds and Their Alternatives: An Experimental Investigation" in Emerald Group Publishing Limited, pp. 39-83.